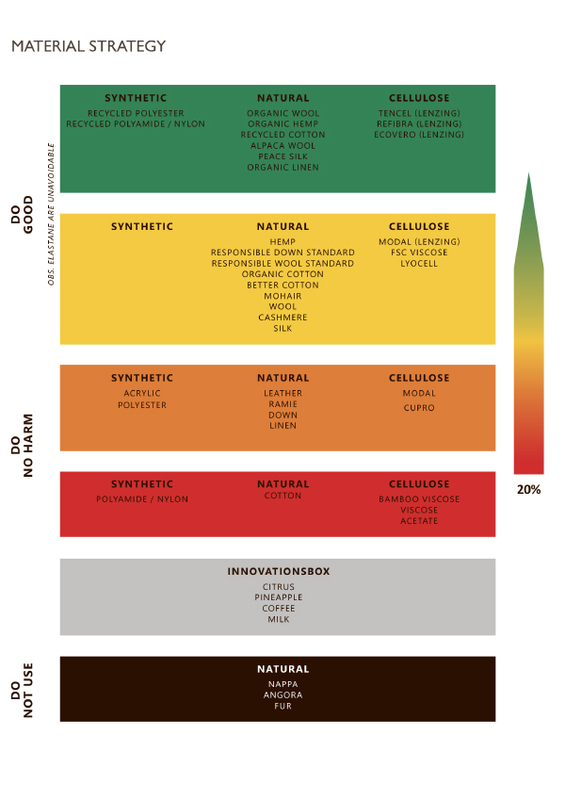 We have identified the materials we use in our garments and categorised these according to six colour codes. Our 202020 goals mean that we want 20% of our entire use of materials to be categorised as yellow or green by 2020. Black is for materials we do not use at all, such as fur and angora. Grey is a box for newly invented materials where we have yet to see the potential before we can start using them. Red and orange are for materials that we do use, but want to reduce use of. This includes traditionally produced fabrics such as polyamide, acrylic or conventional cotton. and wool, recycled polyester or vegetable tanned leather. All our brands commit to the overall goal of using 20% sustainable, recycled or animal welfare materials in our garments by 2020! We have a set of chemical restriction based on which we test our garments before they go to the shop. We test for any chemical that may be harmful to the health of our customers, our enviroment or the workers who produce the garment. In DK Company we have banned the use of real fur and angora wool. Our Animal Welfare Policy prohibits live-plucking of birds and generally unethical treatment of animals.